Dean Corren delivers a concession speech on election night in November 2014. Attorney General T.J. Donovan says he has made an "incredibly reasonable offer" to settle a long-running campaign finance case against Dean Corren, the 2014 Progressive/Democratic candidate for lieutenant governor. Corren's attorney, however, is not prepared to accept. Corren qualified to fund his 2014 campaign through Vermont's public financing system, which imposes strict limits on any outside help for a participating candidate. 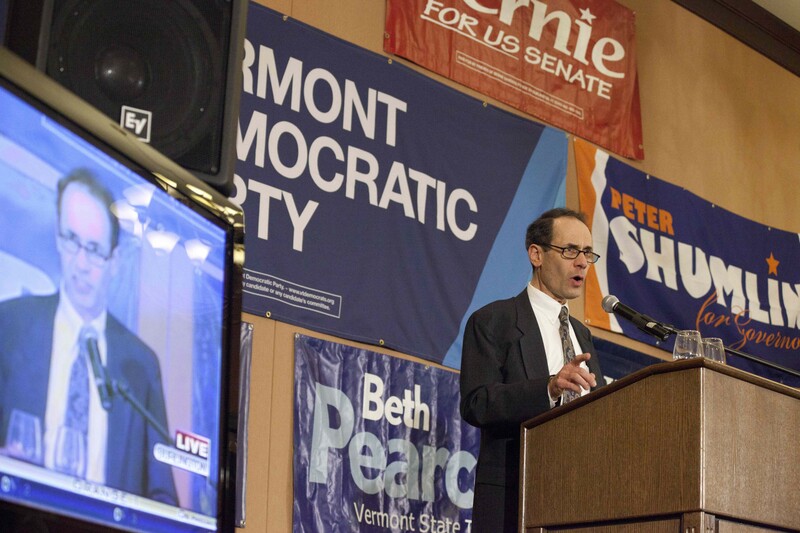 At one point during the campaign, Corren asked the Vermont Democratic Party to send an email blast supporting his candidacy. After Corren's defeat, then-AG Bill Sorrell filed a civil complaint against Corren, alleging that the email constituted impermissible outside support. Sorrell estimated the email's value at $255, but he sought a total of $72,000 in fines and restitution from Corren. The case was still open when Sorrell left office in January. When Donovan became AG, he launched a review of the matter and made the settlement offer "a couple of weeks ago," he says. Citing ongoing talks, Donovan would not disclose any details. Corren's attorney, John Franco, is not in a settling mood. The hangup is a separate federal lawsuit filed by Corren, the Vermont Progressive Party and four other Progressive politicians, alleging that Vermont's public financing law is unconstitutional in multiple respects. According to Franco, Donovan's settlement offer is a package: Take the deal and drop the federal case. "The [federal] suit was precipitated by the threat to prosecute Dean Corren," Franco says. "Unless these issues are resolved, public financing is dead." In Franco's view, the threat of prosecution for the tiniest offense would deter future candidates from using the system. "Any future attorney general could make the arguments that Bill Sorrell made, so we need federal court relief," he concludes. Donovan acknowledges the tie between the two cases. "We are seeking a global resolution," he says. "We want to hit the reset button." Asked about Franco's contention that such a resolution would leave intact a flawed public financing system, Donovan replied, "That's what we have a legislature for." The AG says negotiations are ongoing and that he is "optimistic" about a settlement. "I don't want to send Dean Corren to the poor house," he says. Donovan declined comment on whether Corren is still under threat of the $72,000 sought by Sorrell. The legislature amended the public financing law in 2015, eliminating the possibility of such a hefty penalty, but opinions vary on whether it retroactively applies to Corren. No matter what, Corren has paid a heavy price. Franco estimates his client's legal bills at $30,000. The other plaintiffs in the federal case are Marge Power, Steve Hingtgen, Richard Kemp and Progressive/Democratic Lt. Gov. David Zuckerman. All four have been Progressive candidates for lieutenant governor.